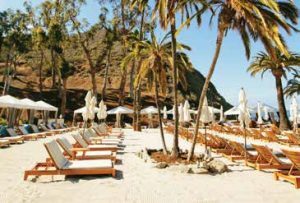 Twenty-six miles across the sea from Southern California sits magical, sun-drenched Catalina Island. Playground to stars of today and yesteryear—from Barbra Streisand, Taylor Swift, and Nicolas Cage to Humphrey Bogart, Clark Gable, and Judy Garland—it even served as home base for Norma Jean before she became Marilyn Monroe. The young newlywed once worked at Lloyds of Avalon Confectionery while her first husband was stationed there during World War II. 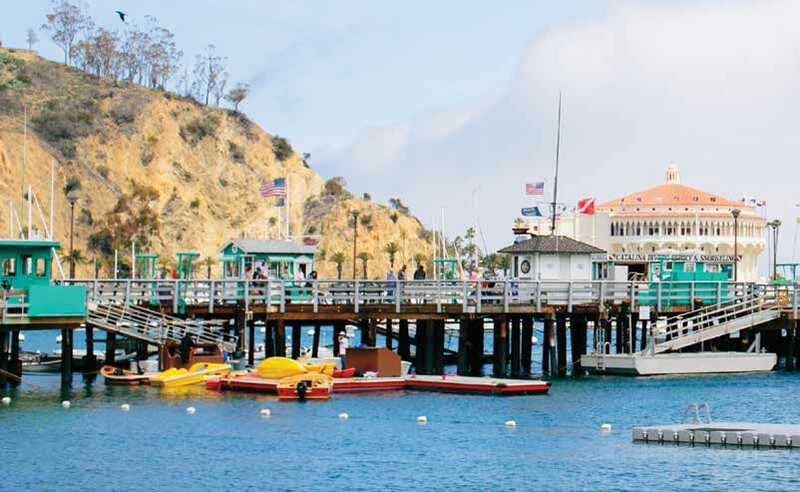 Since 1981, most people travel to the island via Catalina Express, whose ferries provide up to 30 round-trip departures daily to Avalon and Two Harbors. 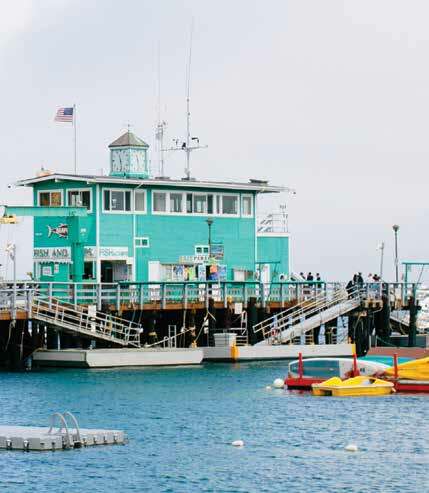 Taking only about an hour to get to Catalina from mainland ports in San Pedro, Long Beach, and Dana Point, Catalina Express also offers great hotel and tour packages for those looking to make the most of their island escape. Those opting for a more Mission Impossible-style grand entrance can fly in on Island Express Helicopters. Catalina’s most renowned landmark, the Avalon Casino, still shows movies each night. During its heyday, big bands, such as Benny Goodman’s, serenaded thousands of dancing fans in the world’s largest circular ballroom. 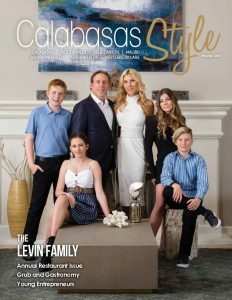 Today, the sky-high room also hosts an annual New Year’s Eve celebration, the Catalina Conservancy Ball, and the popular Catalina Island JazzTrax Festival each October. Travelers wishing to extend their trip can stay at charming B&Bs, guesthouses, and hotels, such as the Pavilion Hotel, a mere 14 steps from the beach. Guests of the Pavilion enjoy lovely ocean views, beautifully landscaped tropical gardens, and complimentary breakfasts. There is also wine and cheese tasting nightly in an open-air courtyard with comfy chaise lounges surrounding a romantic fire pit. Begin the day with a rejuvenating massage or group fitness class at the Island Spa Catalina. Later, sip a delicious cocktail or creamy non-alcoholic Lava Flow beside the sea at nearby Descanso Beach. 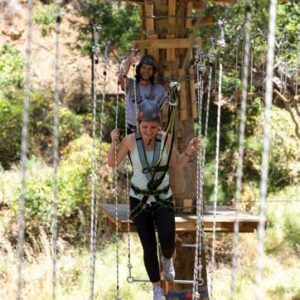 Zip line 600 feet in the air or try an adventurous Aerial Ropes Course for a heart-pounding, bird’s-eye view. Enjoy an array of fresh, sustainable seafood at the Bluewater Grill, set against a stunning backdrop of blue skies, bobbing boats, and the iconic Avalon Casino. Another local favorite is The Lobster Trap restaurant, owned by commercial lobster fisherman Caleb Lins since 2008. 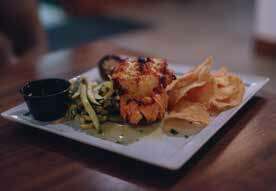 From October through March, you can order their mouth-watering spiny lobster plate. They also serve some of the best tacos in town. Walk off your meal with a hike to the Wrigley Memorial & Botanic Garden, built in honor of the late chewing-gum magnet William Wrigley Jr., who played a major role in developing Santa Catalina Island. Other activities include snorkeling, kayaking, golf, and scuba diving. Shop, rent a golf cart and explore the town, or cool off on a relaxing glass-bottom boat. During summer months, you can even watch Catalina’s famed flying fish on a unique night boat tour. Travel deeper into the island for a glimpse of such four-footed locals as foxes and bison, originally brought here for a movie in 1924. You can also overnight at the more-secluded Two Harbors for the ultimate escape.